BALOO is the introductory training Cub Scout leaders should complete before taking Cub Scouts on an overnight camping trip. The BSA requires that you have at least one BALOO-trained adult on every Cub Scout den or pack overnight outdoor event (regardless of whether it is a pack, district or council event.). Why should I take BALOO? 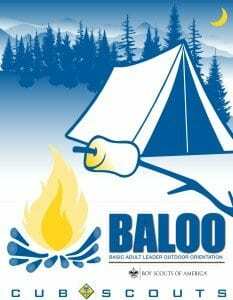 Leaders who complete BALOO training are better prepared to plan pack den or pack overnight events. You’ll learn how to make camping activities and outings more fun, discover how to keep your Cub Scouts safe and entertained, and how to plan an event that’s rooted firmly in Cub Scouting’s principles. Successful experiences in the outdoors make Cub Scouts — and their parents — more likely to keep coming back. How do I take BALOO? BALOO consists of two components: online and hands-on. You’ll need to complete both — in order — to qualify as a “Trained” Cub Scout outdoor leader and receive the BALOO recognition patch. The online portion of BALOO is available on the My.Scouting.org. The goal of the online portion is to make the best use of time to allow leaders to experience as much as possible during the practical (hands-on) training. This 1.5-day course is designed as an introduction to the Cub Scout outdoor program for leaders interested in adding a camping component to their Pack activities.